In this dazzling debut novel, a pregnant teen learns the meaning of friendship—from the boy who pretends to be her baby’s father. When the entire high school finds out that Hannah Shepard is pregnant via her ex-best friend, she has a full-on meltdown in her backyard. The one witness (besides the rest of the world): Aaron Tyler, a transfer student and the only boy who doesn’t seem to want to get into Hannah’s pants. Confused and scared, Hannah needs someone to be on her side. Wishing to make up for his own past mistakes, Aaron does the unthinkable and offers to pretend to be the father of Hannah’s unborn baby. Even more unbelievable, Hannah hears herself saying “yes.” Told in alternating perspectives between Hannah and Aaron, Trouble is the story of two teenagers helping each other to move forward in the wake of tragedy and devastating choices. As you read about their year of loss, regret, and hope, you’ll remember your first, real best friend—and how they were like a first love. 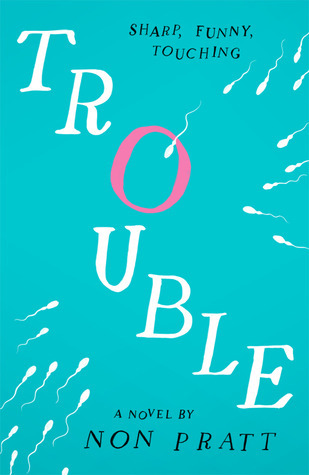 Non Pratt’s debut novel Trouble, is a entertaining and honest look at teen pregnancy. But.. it’s also more than that. Our two protagonists, Hannah and Aaron, are two totally different characters. Hannah is quite high up on the social ladder, every one knows Hannah and she’s built herself quite the reputation. On the other hand we have Aaron, the new boy at school who's reputation is unknown to the school making him fresh meat. But unlike Hannah, Aaron doesn’t know who he is, all he knows is that he wants a fresh start. 15 and clueless Hannah finds herself part of the teen pregnancy statistic, without the baby’s father. Hannah is terrified what the world will think upon releasing the father’s identity and she needs a plan, so why does new boy Aaron step up to play pretend dad? Aaron and Hannah were really interesting characters. Aaron is caring and brave but he’s also lost, just trying to fit in. From the beginning of the book it is implied that Aaron is running away from a dark past and as the story progresses we are clued into how serious it is. I found it easy to sympathise with Aaron because he was such a good guy and caring friend, whereas it was harder to relate to Hannah because she kept making dumb decisions. To say this appropriately, Hannah’s been around. She values self appearance and thrives off male attention. There were moments were I certainly questioned her decisions but I think that made it more rewarding to see her character mature. Trouble is a book that makes you think because I definitely can’t relate to Hannah’s situation but I can imagine it would be extremely hard. As we grew to know Hannah it became easier and easier to connect with her, a character who originally I thought I’d dislike. I liked the sub plots in the story a lot. I mean although a tad predictable it was suspenseful and entertaining as it was slowly revealed who Hannah’s child’s real father was and the story behind Aaron’s past which fueled him to sign up for such a heavy duty. While I was reading this book at school and my friends asked to read the blurb (the sperm cover caught their attention) they all asked why Aaron would sign up for a child that wasn’t his, especially when he has no connection with the mother. But I think the most important part of what came out of that was the friendship between Hannah and Aaron which formed during the course of the story. My favourite part of the book was their friendship because although it formed under odd circumstances, it was very natural and easy going. I loved that Trouble wasn’t necessarily about Hannah’s relationship with men but her relationship with her family and her new friends; Aaron. It was evident in Trouble that the pregnancy didn’t just affect her but also the others around her. I loved how supportive her family were and how Aaron came to be the best fake dad ever. Trouble was a sweet but fun read which I feel weird saying as it deals with such a mature situation but the underlying layer of friendship and family was really special. It was a really entertaining, easy and interesting read, I recommend this. great review, i really really am dying to read this book.. it looks fantastic! I agree, I also won't be able to relate to Hannah's situation but I can always imagine how tough it is for her. I'm glad that even thought it is a tad predictable, it is also suspenseful. Great review Sunny! I think I might request this book because it sounds good and it's not everyday there's a book on teen pregnancy. It's sort of a topic that's never spoke about when really it should be. I'm glad you enjoyed this, Sunny! I feel terrible for not having read it yet, ha! This sounds so wonderful, a great touching story that doesn't gloss over teenage pregnancy. I appreciate that the author covered that topic, although like your friends mentioned it's kind of weird how Aaron would sign up for a child that isn't his. Lovely review, though!